Inspired by the Lady of the Lake block, this quilt features scrappy fabrics in a sashed layout. While our 57” x 74” sample showcases 12 blocks, you can choose to make a larger 74” x 90” quilt. Offered in either Nautical or Batik colorways, this program runs for 6 months. Each monthly packet will include enough fabrics to make 2 blocks with the same color in the center. There will be two center colors used for the whole program. Red and blue are used for the centers and the corners of the Nautical version while the Batik version will have black and white. 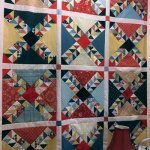 To make the larger quilt, be sure to pick up 2 packets monthly. 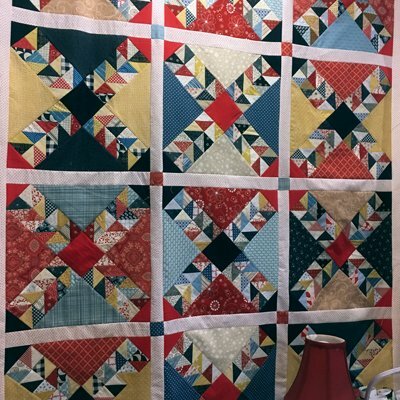 Because of the large number of Half-Square Triangles in this quilt, we highly recommend using the 1-3/4" Finished Half Square Triangle Paper to make accurate and easy Half Square Triangles. There will be enough fabrics in each packet for this method. Finishing Directions will be provided at the end of the program.